The beleaguered publisher has entered into an asset purchase agreement with Clearlake Capital Group. After a long and ugly struggle against insolvency, THQ announced today that it has entered into an agreement with a "stalking horse bidder," Clearlake Capital Group, to acquire all of its assets, including the four studios it owns and the games it currently has in development. The publisher has voluntarily filed for Chapter 11 bankruptcy protection as part of the effort to "shed certain legacy obligations and emerge with the strong financial backing of a new owner." "The sale and filing are necessary next steps to complete THQ's transformation and position the company for the future, as we remain confident in our existing pipeline of games, the strength of our studios and THQ's deep bench of talent," THQ Chairman and CEO Brian Farrell said in a statement. "We are grateful to our outstanding team of employees, partners and suppliers who have worked with us through this transition." As a "stalking horse bidder," Clearlake is offering approximately $60 million for THQ's assets, which includes $10 million to cover the company's creditors, but other interested parties may come forward with competing offers during the sale process. The Section 363 sales process, as explained by Financier Worldwide, allows THQ to establish a minimum bid that other bidders will have to beat. "In exchange for coming forward and negotiating the initial APA with the seller/debtor, the bankruptcy court often grants the stalking horse certain bidding protections, such as expense reimbursement, and break-up fees in the event its bid is exceeded," the site says. The good news is that THQ will continue to operate, its studios will remain open and all current game development will continue. 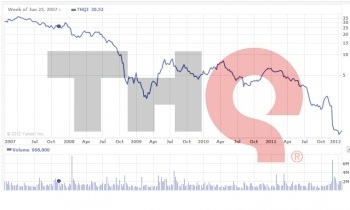 "Consumers and retailers should see no changes while the company completes a sale," THQ said in a statement. "The new financing will support business operations throughout the period. THQ does not intend to reduce its workforce as a result of the filing, and employees will continue to work their usual schedules and receive normal compensation and benefits, pending customary Court approval." THQ expects the sale to be completed in roughly 30 days.